I bought this really nice Petersen type L sword last summer from a guy at a festival in Denmark. 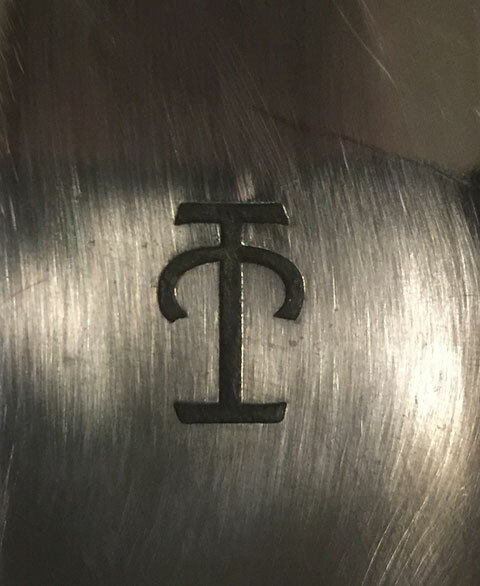 Does anybody know whose maker mark this is and where on the Internet this smith can be found? Do you have any pictures of the rest of the sword? Was that the Viking festival in Aarhus? I love that! It was at Moesgaard. The last battle was awesome, even If I was killed after 5 minutes. Here's the sword. It is Anglo Saxon not Norse and English swords weren't terribly common in my neck of the woods. However, it was the one that had the best balance, which translates into less tennis-elnbow than with the Petersen type X that Paul Binns made for me. That enormous pommel on the type L gives good balance but the one down side of the type L is that sometimes when I chop with it and bend my wrist, the pommel kind of squishes into my forearm. In general I prefer pommels to be higher and less wide and for that reason I prefer Binns's Petersen type X, the Brazil nut pommel on the type X does not have this problem but at the expense of a slightly worse balance. 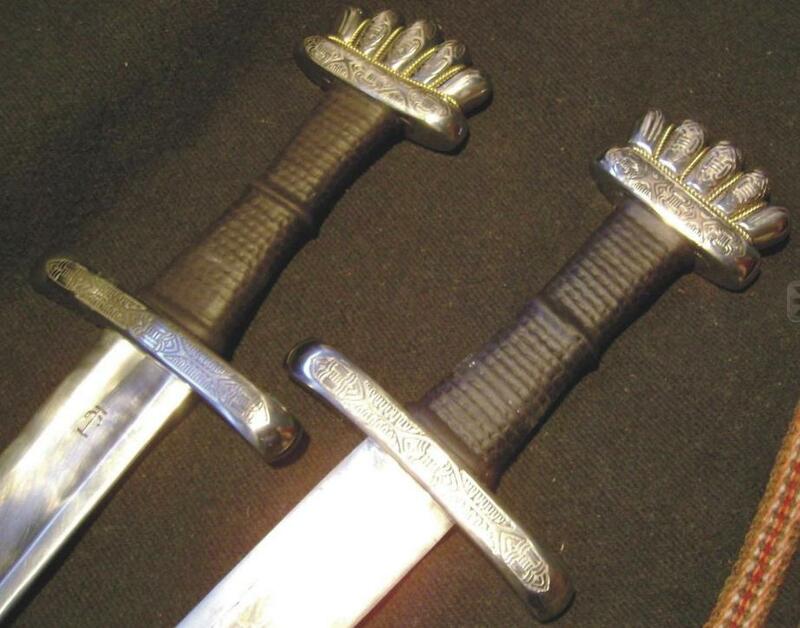 I have from Wojciech one handed sword, type XVI, based on find from Denmark and it serve me very well. Thanks, I ran a every Google search I could think of, but no cigar. It seems that I have been misspelling 'Wojciech' for three weeks. Yeah, expensive but worth it, and they look good without being insanely gaudily decorated. I am a mimimalist I hate gaudy swords or anything gaudy for that matter. The one fault I can find with my Type L is that the hilt is slightly crooked which means that it never sits quite right in the scabbard (not really an issue but I'm a perfectionist) and the blade is not polished to a mirror sheen. The sword is fairly well balanced but it was also by far the best balanced one he had on offer, probably due to the monster pommel. The rest of the swords he had were a bit front heavy. In a real world sharp sword that would be good because it helps you to do more damage (and gives you a much nicer and more painful tennis elbow) but with these blunt re-enactment swords you want the balance point to be close to the hilt so you have more control and don't hurt people. Having said that, I'm going to ask Wojciech to make me Petersen Type O sword with a whale tooth hilt.